It is difficult to say what love is. But this much is clear: it is something to do with kissing or so. 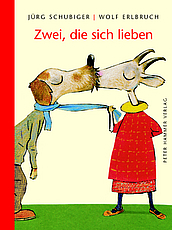 Two in Love is a little gift book for all those who contemplate love. Wondering who wants to kiss whom and who may or even should do so. Wondering about the before and after. The longing, finding, enjoyment and saying goodbye. Wolf Erlbruch has always been interested in these things and now delights us with many pictures of marvellous couples. Jürg Schubiger now has – to his apparent enjoyment – found verses to accompany Erlbruch’s pictures. Together they convey a very optimistic view: overall, love is beautiful rather than difficult. And so is kissing anyway.